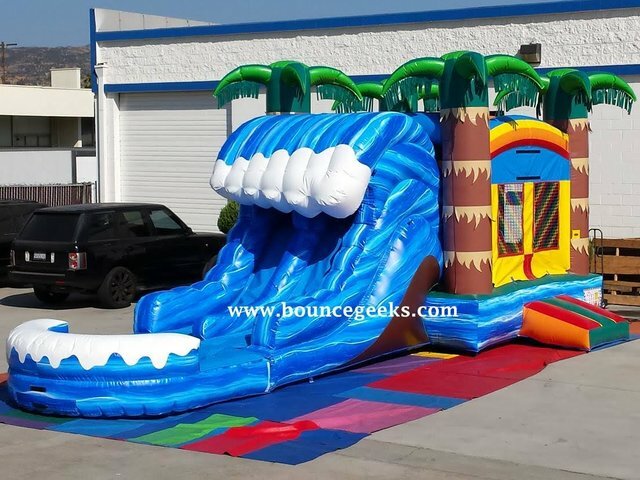 Tropical Wave Dual Lane Combo Bouncer Rentals | BounceGeeks.com Richmond, VA. When you want the "Wow Factor" you need the Tropical Wave! Wow! That's what they will say when they see this amazing Tropical Wave combo! This is an awesome inflatable combo, providing a huge bouncing area, a climbing ramp, a basketball hoop, and a dual lane slide. The slide can be used wet or dry. At the bottom of the slide there is a splash pool which is super fun when you attach your garden hose. This price is for dry use only. To order wet with a sprinkler hose, just choose the wet slide option after adding to cart. Note: basketball is not included. If you want to use a ball, it MUST be something soft so no one gets hurt!